While in London we went to the Design Museum. The Designer of the Year competition was taking place. Although not the one I voted for, I loved Jamie Hewlett's exhibition. of the band through printed and onscreen presentations. 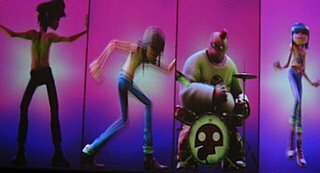 The virtual band members are Murdoc, 2D, Russel, and Noodle. making gorillaz the most successful album ever by a virtual group. 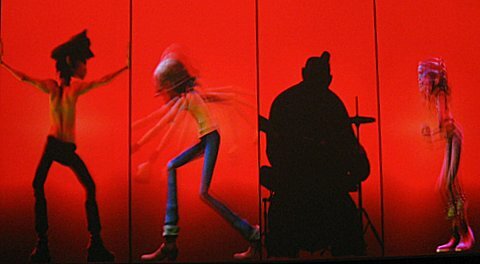 into complex quasi-holographic performances in 3D. You loved Jamie Hewlett's work but did not vote for him? Why? I bet you voted for Cameron Sinclair! When we were there I voted for Paul Cocksedge, the way cool llighting designer, and he won. I have now voted for Jamie Hewlett. So you know why he got my vote. Did you like what Sinclair did? Or was the vote for what he is doing? I admire the work he is doing but this is for DESIGNER of the year not humanitarian. There were better solutions at the SAFE exhibit at the MoMA that we saw. That is one of the reasons I would not have voted for him. I loved what Sinclair did. He DESIGNED some great solutions and his designs are making a difference. yes what he is doing was a factor for me too. I agree, there were excellent solutions at the SAFE exhibit but they were not part of this competition. But his designs/solutions were not as great as what was in the SAFE exhibit. That is why I would not have voted for him. I had seen better. Hewlett, however, is doing something new and moving things ahead in to the future. That is worth a vote to me. And I believe Sinclair's designs work and make a nice humanitarian difference, which was worth a vote to me. All four designers had merit. Not HUMANITARIAN of the year. DESIGNER of the year! We will just have to wait and see who wins! DESIGNER of the year who is also a HUMANITARIAN. The Guardian will probably win. i do not care if he is the King of Siam! If his design don't do it. . . This is a DESIGN competition. Not a HUMANITARIAN competition. Not a BEUTY competition. It is about DESIGN! YOU voted for Jamie Hewlett - GOOD FOR YOU! I voted for Cameron Sinclair - GOOD FOR ME! We DO NOT have to agree on this. I voted for a DESIGNER, you voted for a HUMANITARIAN. OMG, you are cracking me up. 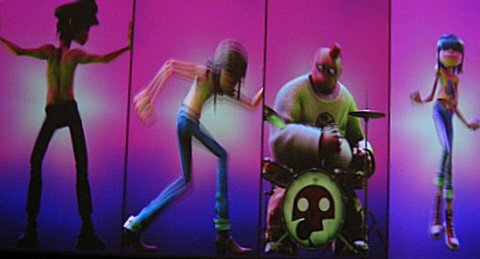 Hey, I love Gorillaz!!! I saw them on the MTV Music Awards, so cool. Great post!